Sheree Ohen, one of four finalists for the inaugural position of vice president for equity, inclusion and diversity, speaks at an open forum in the FAIRWINDS Alumni Center Wednesday. Four finalists have been selected for the new position of vice president for equity, inclusion and diversity, a position that President Dale Whittaker decided was a strategic priority in his new administration, said Jennifer Sandoval, associate professor and search committee chair. 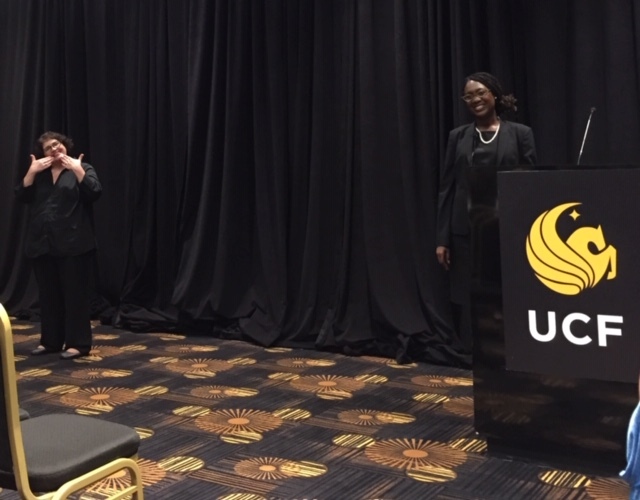 The second finalist, Sheree Ohen,answered questions and discussed how she intends improve diversity and inclusion at UCF, in front of about 40 people at an open forum in the FAIRWINDS Alumni Center’s Grand Ballroom Wednesday. “One thing that I learned over my evolution of a leader is how you lead with compassion, transparency, authenticity and people understanding,” Ohen said. Ohen said she wants to do a listening tour to talk to departments and student organizations, understand their needs and concerns. “I don’t believe I can do this work without understanding the pulse of the institution, having that human connection,” Ohen said. UCF already has an office of diversity and inclusion, but there was no one at the executive level leading the office. “We had a meeting with the president about his commitment to diversity, inclusion and equity, out of that came this recommendation that we need to have [someone] at the vice president level to account to these issues,” said Fernando Rivera, associate professor of sociology and a member of the search committee. Ohen was asked by Matt Ricke, assistant director at the Office of Institutional Equity, about her stance on free speech rights, in light of the notion that free speech is being stifled by diversity and inclusion efforts. Ohen said this was something she made an effort to address. The other two finalists will be attending open forums in the same location on Thursday and Friday. Information about the finalists, the times of the open forums, and videos of this and the previous forums are available on the Office of Diversity and Inclusion’s website. These open forums are an opportunity for the campus community to provide feedback to the search committee and help in their efforts to give recommendations to the president who will make the final decision, Rivera said. Everyone is encouraged to provide feedback within 24 hours of each forum through surveys available on the website.